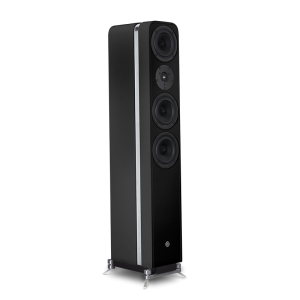 The Phi5 MKII is the smallest of our floor-standing speaker in our Phi series. The Phi5 MKII with the improved sonic foundation of the laminated form pressed enclosure and new woofer and midrange finished off with a hand doping using a proprietary organic leather oil treatment, first used for our El Superiores mid/woofer drivers. a twistable knob to eliminate resonances in the coupling between the speaker and the floor. With its three proprietary GamuT designed 5,5′ woofers and a newly optimized dual ring radiator tweeter, the performance of the Phi5 sets new standards for speakers in its size and price range. Use the Phi5 as the main speaker in a 2-channel setup, or in an exclusive surround setup in combination with the Phi3 and Phi-LCR.